Generally, it is easy to understand spousal sponsorship is a program which is only available to individuals who are legally spouses. At the same time, most people know the government awards the same opportunity to couples who are long-term partners, who essentially act the same as spouses would, simply without being married. These alternative programs are offered because long-term partners generally want to live together full-time, and this is not possible if both individuals do not have permission to permanently stay in the same country. Though, only offering the opportunity to sponsor a partner who is your spouse can easily have the effect of forcing couples to marry, which is not the intention of the Canadian government. Therefore, it is possible to sponsor your partner through either the conjugal sponsorship program, or the common-law sponsorship program, depending on which program you and your partner are eligible for. 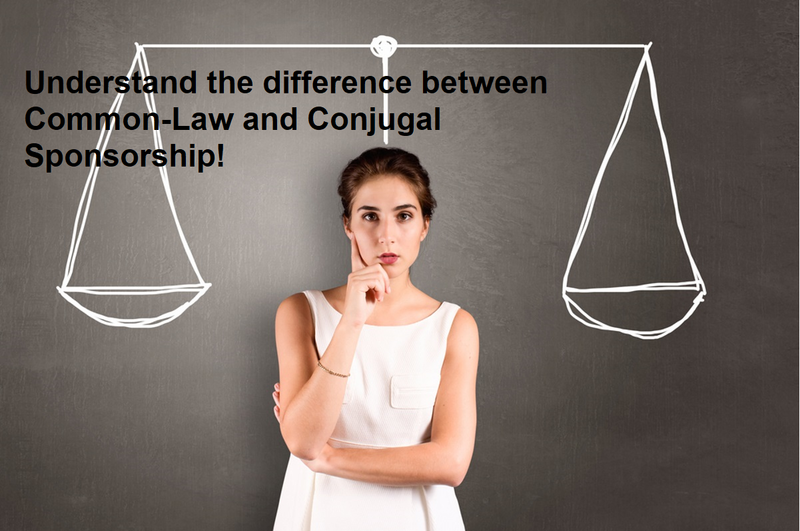 In this article, I will break down The Difference between Common Law and Conjugal Sponsorship. There are a variety of requirements which apply regardless of which program you choose to sponsor you partner through. For example, both partners must be 18 years old at the time of applying. Furthermore, the sponsor must be a Canadian citizen, a registered Indian or a permanent resident of Canada, and must be financially able to provide basic necessities for your partner. Finally, the principal applicant (the sponsor’s partner), must not be criminally inadmissible to Canada. Shared utility bills; gas, telephone, electricity ect. Receipts of purchases for the household; such as furniture, appliances, etc. Government documents that show the same address such as driver’s licenses and insurance documents. To be eligible for conjugal sponsorship, you must meet some very specific requirements. This program was brought in to allow long-term partners who are unable to live together due to extenuating circumstances, but wish to live together permanently. If it were possible for you and your partner to live together, it would be expected that you are, and you would then be eligible for common-law sponsorship. So, to be clear, conjugal sponsorship could occur in a case, for example, you are a citizen of Canada, and your partner is a citizen of Jamaica. As the result of your situation, you are unable to meet the residency requirements of a common-law partnership, but could still be eligible to as conjugal partners, as long as you can prove your inability to cohabitate is out of your control. It is important to understand the difference between common law and conjugal sponsorship. it is not a matter of choosing which sponsorship program seems easier to you, rather, you must assess your situation carefully, and determine which application process is the one you must apply for. Obviously, if you and your spouse are married, you must apply for spousal sponsorship. Or, if you and your partner live together or there is the possibility you could live together, because there are no special circumstances precluding the possibility, then you must apply for common-law sponsorship. While finally, if you and your partner cannot or are choosing not to get married for a strong reason, and you cannot possibly live together, then you can apply for conjugal sponsorship, but only in these restricted circumstances. Failing to apply for the right sponsorship program for you as the result of not understanding the difference between common law and conjugal sponsorship, will negatively affect the processing of your application, as it makes it much more difficult for an immigration officer to assess the genuineness of your relationship and trust that you are applying for sponsorship to reunite as a family, not simply to get permanent residency in Canada. 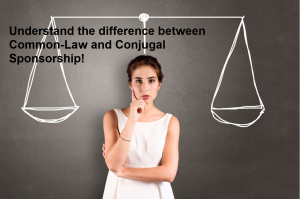 Before applying for Common-Law Sponsorship or conjugal sponsorship to unite with your partner in Canada, it is highly recommended that you have taken all the aforementioned information into consideration, and understand the difference between common law and conjugal sponsorship. If you are in a long-term serious relationship, it is very important to understand your situation with your partner, to ensure you build a strong application under the most suitable sponsorship stream. If you would like to apply to sponsor a spouse, it is extremely vital to note that these are difficult applications to pursue on your own. Therefore, it is highly recommended that you seek out professional and experienced help before submitting a sponsorship application. Here, at Akrami & Associates, we work and have experience with many different immigration matters. We have helped many of our clients reunite with their common-law partners in Canada. If you believe that you may be eligible to apply for a Common-Law or conjugal sponsorship, please feel free to contact Akrami & Associates at our office at 416-477-2545 for more information or if you would like to book a consultation with an immigration professional for more advice. At Akrami & Associates, there is always a way!